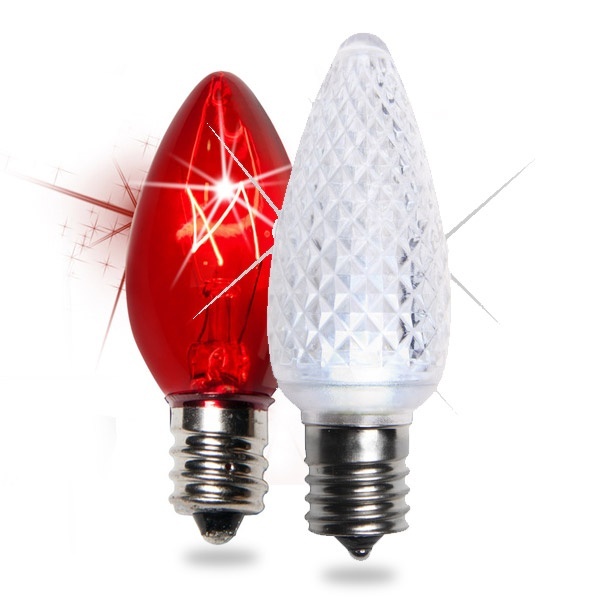 C7 Bulbs - C7 Christmas light bulbs are smaller than C9 bulbs and very popular for decorating indoor trees, illuminating mantle displays and wrapping columns, railings, outdoor bushes and small shrubs. 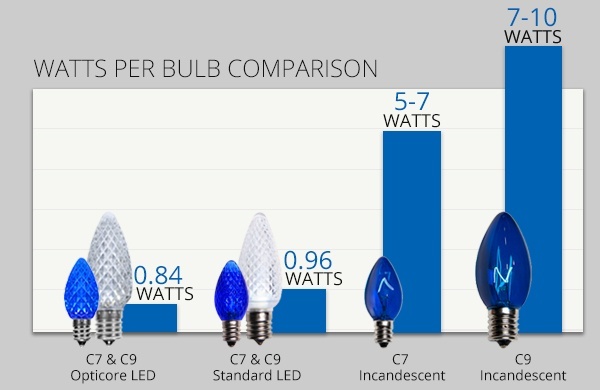 C7 bulbs are also a convenient size for decorating smaller residences, apartments, and townhouses. 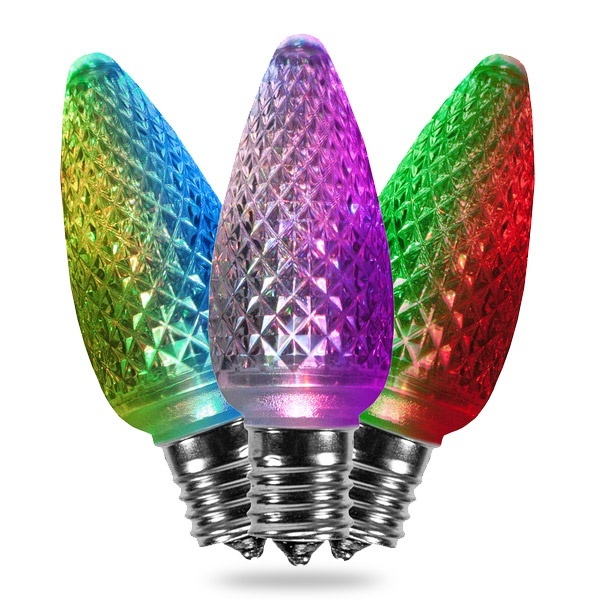 C9 Bulbs - As a result of their larger size, C9 Christmas light bulbs produce exceptionally bright light that can be seen from far distances and the roofs of taller buildings. C9 bulbs are a great option for large scale lighting displays and work well wrapped around tall outdoor trees or outlining walkways and roofs. In addition to their holiday uses, C9 bulbs have also become a popular alternative to globe lights for summer patio lighting. When researching different types of bulbs you may have noticed that base size is also used as a reference. C7 bulbs have E12 bases and C9 bulbs have E17 bases, however many other bulb sizes are also available in these same base sizes. The great part about different size bulbs having the same size base is that you can use the same E12 or E17 socket size stringer and swap out your bulbs if you want to change up your display! For example, if you wanted to line your roof with C9 Christmas lights in the winter and G40 globe lights in the summer, you could simply swap out the C9 bulbs for globe light bulbs with the same E17 base size! Knowing how many watts are in each type of bulb is one of the most important aspects of planning your Christmas lights display. Incandescent bulbs have much higher wattages than LED bulbs and may require the use of additional outlets to avoid tripping the breakers in your fuse box. 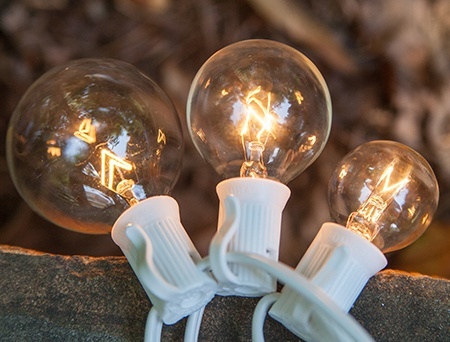 In addition to energy savings, bulbs that use less watts allow more light strings to be connected end to end, which means easier installation for larger light displays. 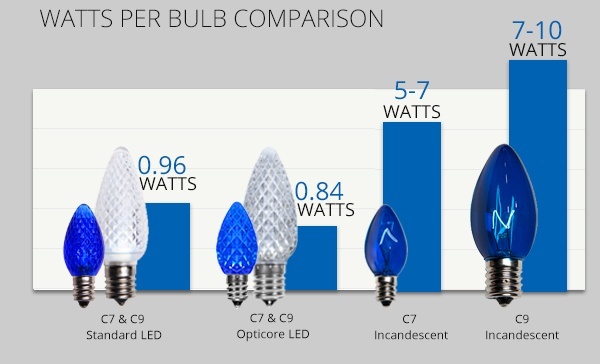 For example, you can connect between 100-500 feet of C9 LED bulbs at 0.84-0.96 watts per bulb, whereas only about 50-100 feet of incandescent 7-10 watt C9 bulbs can be connected at one time. For more information, visit our Christmas Light Wattage page. 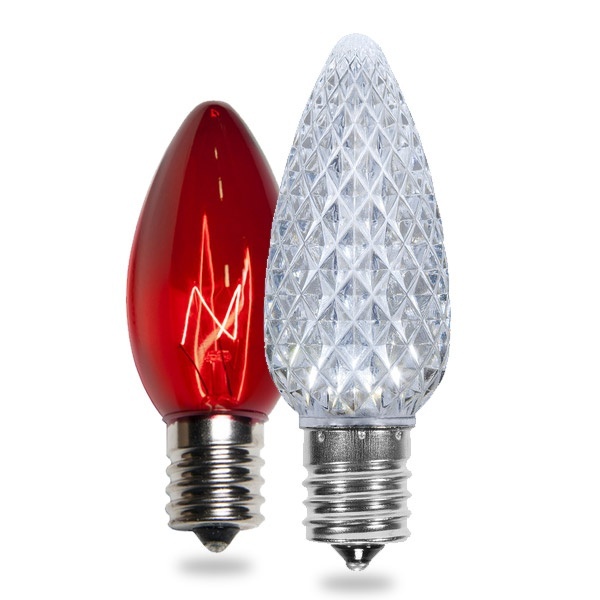 C7 & C9 Christmas light bulbs will have either a traditional glass or a durable acrylic lens. 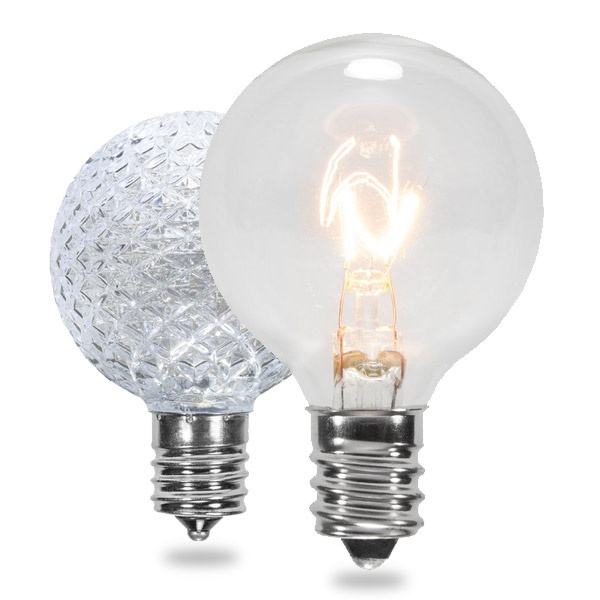 Incandescent bulbs always have a glass lens and are generally either transparent or painted with an opaque finish, whereas LED bulbs are available in glass or acrylic with several finishes. 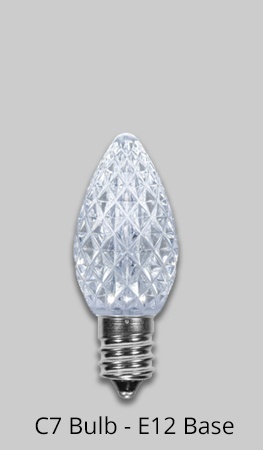 Transparent - A classic choice for Christmas lighting. Transparent light bulbs can have either a glass or acrylic lens, display beautifully in almost any space and go well with any color combination, making this finish one of the most popular of all! 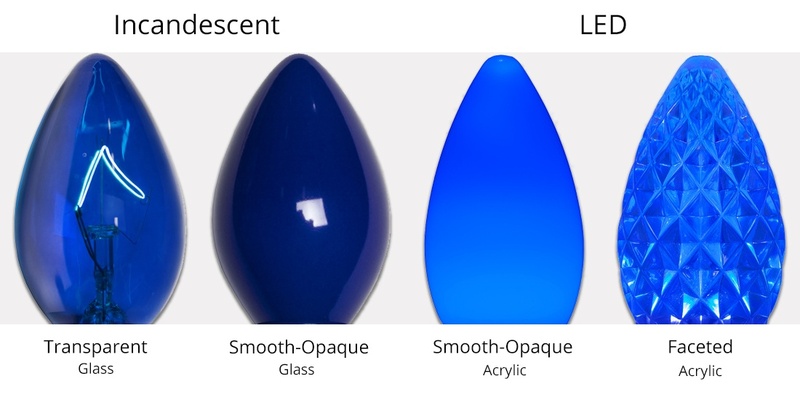 Smooth Opaque - Bold colors, perfect for an outdoor party or colorful Christmas light display. 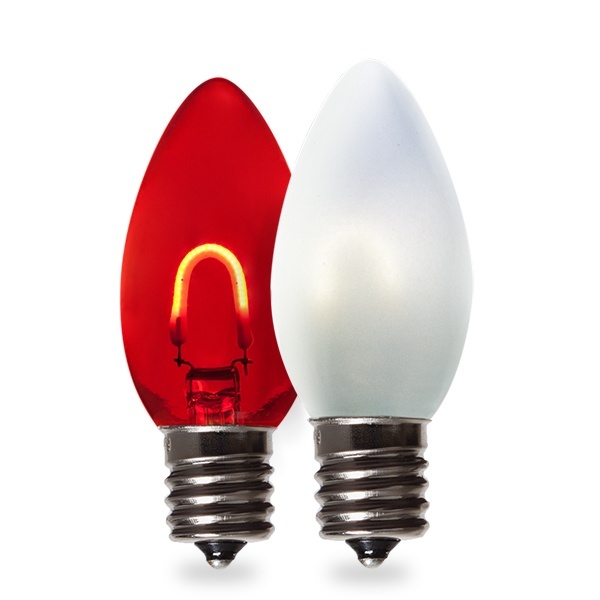 Mix and match opaque bulb colors to create unique lighting themes or hang all white smooth-opaque finish incandescent or LED lights and let your existing decor shine. Satin - Satin finish bulbs create an ambient glow and are an elegant addition to wedding venues, outdoor parties and indoor spaces. 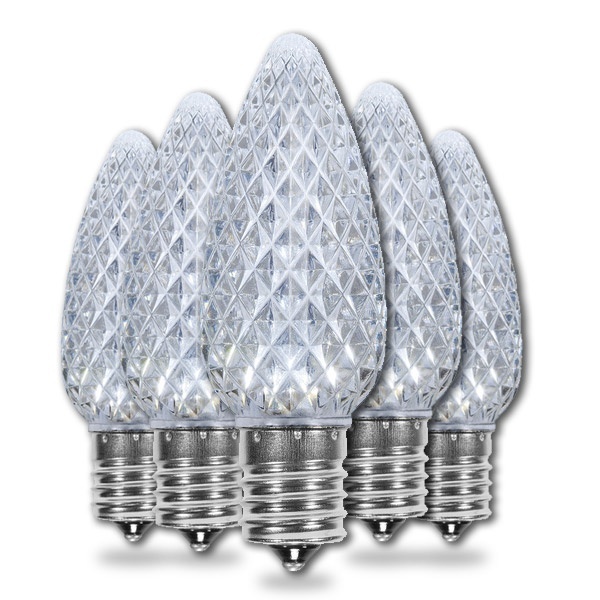 These bulbs also look beautiful when not lit and can double as a decorative accent when not in use. Faceted - The faceted design of our C7 & C9 LED light bulbs reflects a stunning light pattern when hung next to solid surfaces and is very popular in Christmas light displays. 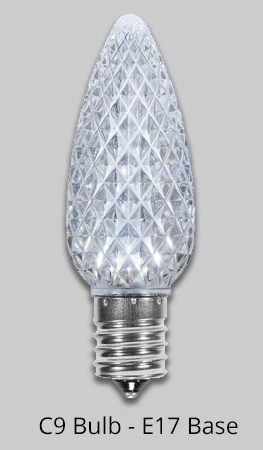 Faceted bulbs are made out of a durable acrylic which provides longer life and worry free installation. 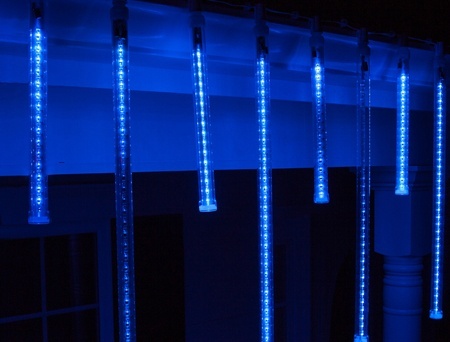 Cascading light tubes and molded icicle lights mimic the dripping effect of falling snow and melting ice. 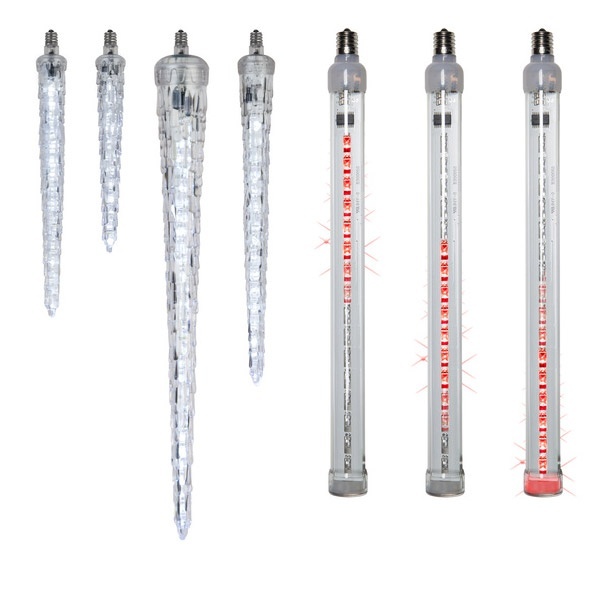 These spellbinding lights are available with E12 & E17 bases sizes and can be displayed alone on a stringer or alongside C7 & C9 light bulbs with the same base sizes to create a unique animated light display. 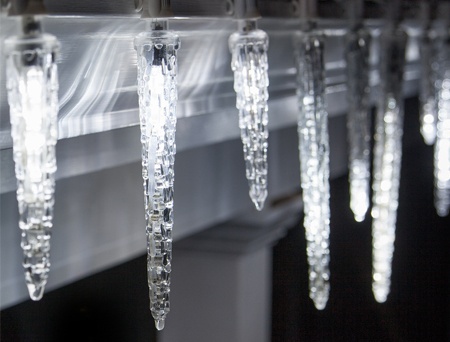 Try hanging cascading light tubes and realistic LED icicle lights from the porch or tree branches to create a eye catching effect and enhance your winter wonderland themed light display. Like C7 & C9 light bulbs, globe patio lights also have E12 and E17 bases which allows them to be interchangeable on a stringer with a coordinating socket size. 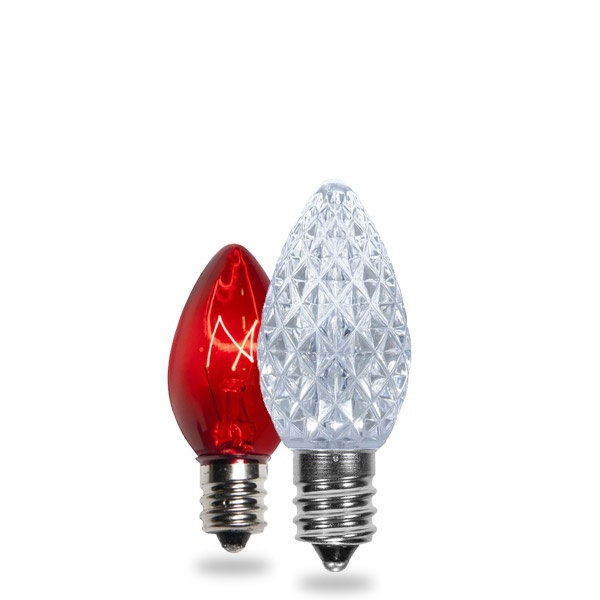 The ability to swap out bulbs without having to also replace an existing light string is very convenient, especially for seasonal decorating. For example, if you outline your porch or deck with C7 or C9 bulbs during Christmas, you could replace your holiday lights with festive globe lights to brighten your outdoor spaces during summer time as well! 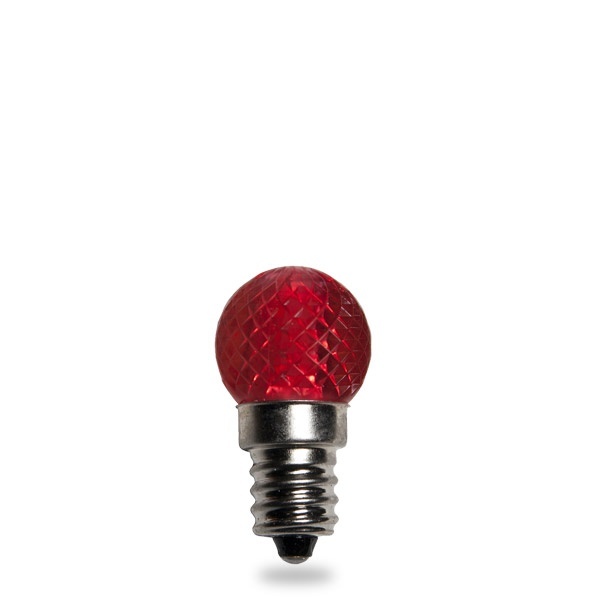 Globe lights are available in several sizes from a small G30 (30mm) bulb all the way up to a much larger G125 (125mm) light bulb. There are also a variety of colors and finishes to perfectly match any space or theme.